Normal digestion occurs when food is broken down in the stomach and bowel, then absorbed in the bowel. These absorbed products are carried by the blood to all parts of the body. Tube feeding is when a special liquid food mixture containing protein, carbohydrates (sugar), fats, vitamins and minerals, is given through a tube into the stomach or small bowel. People of all ages receive tube feeding. It may be given to infants and children, as well as to adults. People can live very well on tube feeding for as long as it is needed. Many times, tube feeding is used for a short time--the tube is removed when the person can begin to eat normally again. How is Tube Feeding Supplied? Tube feeding can be given through different types of tubes. One type of tube can be placed through the nose into the stomach or bowel. This tube is called a nasogastric or nasoenteral feeding tube. Sometimes the tube is placed directly through the skin into the stomach or bowel. 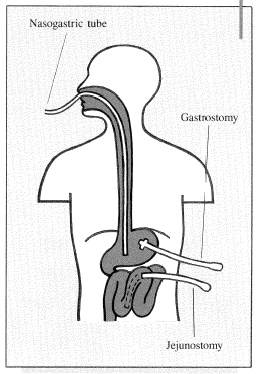 This is called a gastrostomy or jejunostomy. Your health care team (doctors, nurses, dietitians, and pharmacists) will talk with you about the different types of feeding tubes. Copyright © 2010 EBSCO Publishing. All rights reserved. The content provided herein is not medical advice and is provided for informational purposes only. The content is not intended to be a substitute for professional medical advice, diagnosis or treatment. Always seek the advice of your physician or other qualified health provider with any questions you may have regarding a medical condition.